What do you need to know about car seat safety for your child? Before you get into your car, you want to make sure your child is safely strapped into a car seat. There is no car seat that is the safest or best one. It is most important to find one that fits the age and size for your child, works with your car, and is easy to use. How do you begin? 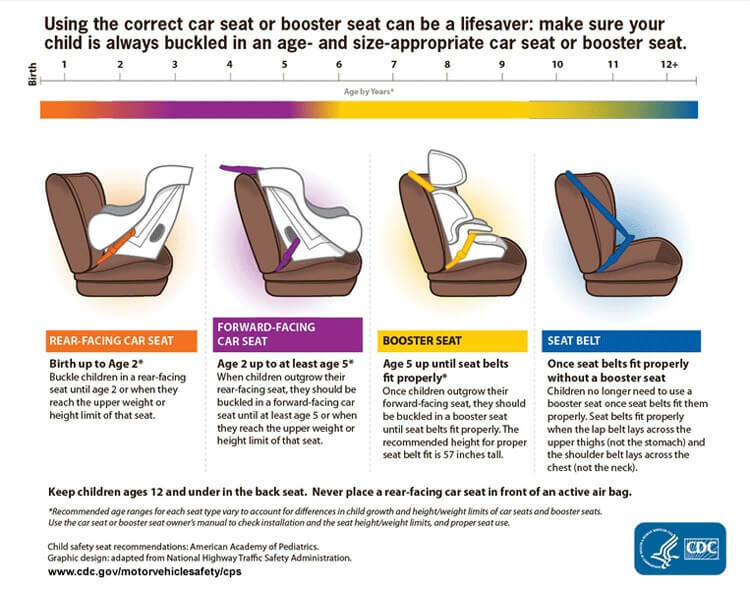 Make sure you know the Louisiana car seat laws before you choose a car seat. Getting the information you need will save you from penalties if you fail to follow the law. Know, too, that there is help if you have questions. Rear-Facing or “infant-only”; babies to 1 yr. old and under 20 lbs. ; some rear-facing seats go up to 35 lbs. Convertible; infant to toddler; children learning to walk; at least age 1 and 20 lbs. and up to the seat limits in the car seat manual. Forward-Facing; 1-4 yrs old and 20-40 lbs. ; seat has its own harness. Booster Seats; children 4-6 yrs. old, under 4 ft. 9 in. ; 40-60 lbs. ; belt-positioning seat. Lap and Shoulder Belts; 6 yrs. and up; over 60 lbs. Keep your child in the back seat until at least 12 yrs. old. The Louisiana Highway Safety Commission (LHSC) believes that children are safest in a car if the above rules are followed. If a child is not ready for the next step, keep him or her in the more protective seat. Child safety comes first in Louisiana. Be sure you follow the laws to find the right type of car seat for your child. When you find a car seat, look at the car seat manual instructions carefully. You want to make sure you understand how the car seat fits your child and and when you will need to change it. The NHTSA website can help with choosing and installing car seats, in a step-by-step process. They also give information on where to get free safety checks for the car seat: NHTSA Child Car Seat Inspection Station Locator. They will send you emails on recalls if the seat is not safe. If you do not follow the laws on car seat safety, you may get a ticket and a fine. The amount will increase after each offense. If you do not have the proper safety seat, you may get your license suspended.You have 30 days to prove that you have the right car seat. R.S. 32:414T. Make sure your child is safe while traveling in your car. If someone else is driving your child in their car, the same laws apply. Plan ahead to make sure that your child is protected in the right car seat. If your car seat is recalled, keep the child in the same car seat until you get a repair or a new one. Even if you knew and followed all the rules on child car seat safety, an accident can happen. If another driver causes you or your child to be injured, contact the Law Offices of L. Clayton Burgess immediately. A Louisiana Personal Injury lawyer, he knows how to handle car accident claims. Get a FREE consultation to get your questions answered. You will get the best advice on how to handle your claim. Contact us toll- free at 1-877-234-7573.